Click on the icon above to download the free app to get school information straight to your smartphone! Our school App works on iPhone, Android and Windows phone platforms. It is free to download and is an invaluable source of instant information from the school. We have found this to be particularly helpful to parents who do not speak English as a first language as the app is available in 11 languages. (Once the App is downloaded, click on more at the bottom of the main page, then settings and then language). You can also choose to receive an alert whenever new items are posted. 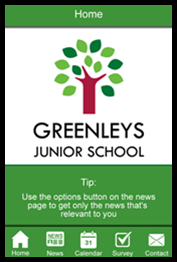 You can visit the app store to download our official Greenleys Junior School App. For iPad, please search Greenleys Junior School under iPhone applications. For other phones, please visit Google Play.